For complete pricing, please fill in our “plan and price” form. Our all-inclusive wedding package is available any day from mid-March through mid-November. This package is designed for weddings with 20 to 200 people. If you have fewer than 20 guests attending, please consider one of our elopement packages. Our package is a place to start; we can change the package and adjust the price. You may add and subtract people and time as well as photography, centerpieces, etc. Most people book their weddings with the minimum number of guests you expect and add-on additional guests, if any, a month before the wedding when they have received responses to their invitations and know how many of those invited are coming. The deposit for this package is just $500 (if wedding is 5 months or more from the time you book). We then divide the balance of your contracted amount into monthly payments that are due the same date of each month as your wedding date. The final payment, along with payment for additional guests, if any, is due a month before your wedding. We send you a checklist for planning; you only have to contact one person about anything needed for your wedding at our venue from your decorations, food and cake choices, music, and more. You can’t have a more relaxing and enjoyable wedding experience! We offer a 10% military discount on the base rate of the package and on the catering included. You are considered eligible for the military discount if either member of the couple has EVER served in the military. We also offer a 10% educator and social worker discount. One of these discounts may be applied per event. There is also a 5% discount for payment in full at the time of booking. The 5% is off the total amount you choose as the base rate for any of these wedding packages with catering included if you book more than 4 months before your wedding date. Customized sound service for ceremony; DJ will provide music via speakers and will provide microphone for couple and minister. Our staff to set up all our provided tables, linens, ceremony decor, etc. and we will help set up items you provide such as centerpieces, guest book, etc. Outside vendors are responsible for set up of any vendor provided items (typically live flowers or rented decor). Platinum Catering Package: Your choice of any five appetizers, any three entrees; any four sides; and premium dessert: $48 per person tax included. Also includes your choice of white or mismatched china and linen napkins. BBQ Catering Special (40 person minimum)- Appetizer – salad bar; Entrees: Our famous pulled pork shoulder & BBQ chicken; sides – potato salad, slaw, baked beans, mac and cheese, and rolls with butter – $22 per person tax included. Taco bar – Seasoned taco beef, pulled chicken, refried beans, queso sauce, hard and soft taco shells, and toppings (lettuce, sour cream, tomatoes, cheese). – $16 per person tax included. Just Apps – choice of any 4 appetizers – $18 per person tax included. Add on catering a la carte. Prices include tax. Wedding cake: Multi-tier round wedding cake – $5 per person in your choice of design and flavors. Top layer for couple to keep is included as is cake cutting and serving, plates, forks, and napkins. Bartender service for reception (includes bartender, liquor liability insurance, cups, ice, etc. )- Per bartender – $200 for first 3 hours of reception; $100 each additional hour. Note: Couple provides all alcohol. Leftover alcohol returned to couple at end of event. With our bartender service, you may bring up to 8 flavor choices of beer and wine and have up to two signature mixed container liquor drinks (more than 50% non-alcohol). Remote ceremony set-up – If you prefer your ceremony to be in a location other than a site adjoining the main house, it may require additional staff and set up time for DJ equipment, power cords, chairs, arbor, decor, etc. There may be an additional cost for a remote ceremony location set up. Photography by Wendy Waldron – $300 first hour; $250 each additional hour. All photos by our photographers given to couple with high resolution download. 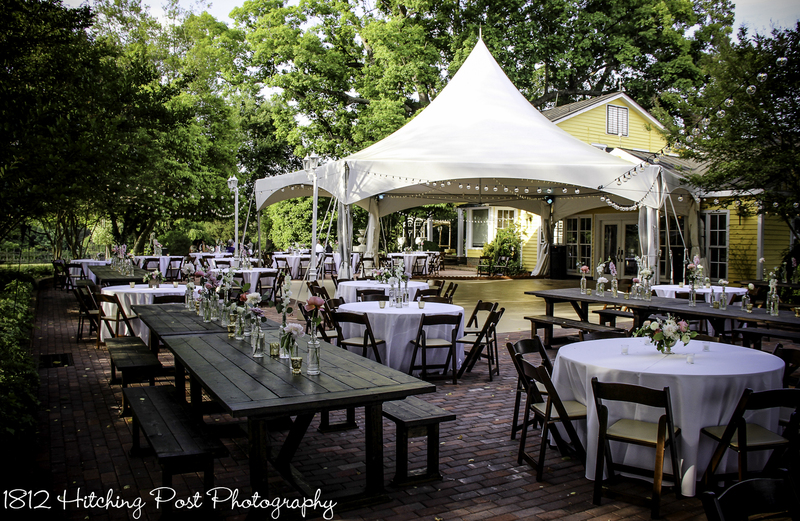 Willow Cottage – rehearsal time through end of wedding reception – $100. Outdoor games – Corn hole, giant Jenga, giant Connect 4; Ladder Golf; disc Golf; and bocce ball available for rent – $30 per game or $100 for choice of 4. Set-up included. You are also welcome to bring and set-up your own games. All weddings with receptions in the evening will also have all of our outdoor lighting including twinkle lights, DJ lights, tent lights, and tiki torches unless you prefer otherwise. For specific date pricing, please fill in our “plan and price” form.